At the time of buying changing table It should take into account some points. This value is the room where you plan to place the changing table, and its purpose. If you use table also as a place to store your baby's clothes and other things, stop your choice on a multi-tiered table or purchase a changing table, wardrobe. It is worth paying attention to the extra accessories for changing tables, specially invented by the designers of the Swedish furniture manufacturer. These accessories are presented furniture covers, Swaddle sheeting, Changing tables for sets of containers, as well as extra work surfaces for a changing table. Let us dwell on each of the categories changing tables, emphasizing their advantages and features. 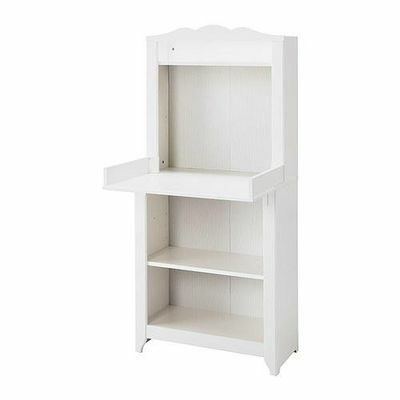 Thus, a two-tier SNIGLAR changing table It is a piece of furniture 87 cm tall, which is quite comfortable characteristic. 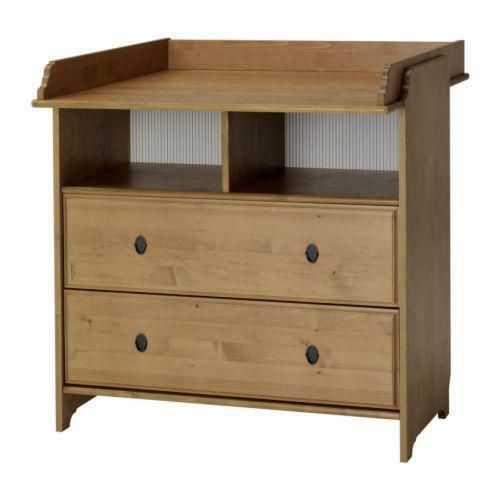 Thanks to the second tier, the changing table has a practical storage space for necessary accessories. All things baby will be at your fingertips and you do not have to leave your child unattended even for a minute. SNIGLAR changing table is made of durable and environmentally friendly solid beech and covered with acrylic paint. Three-tiered changing tables presented a model called SUNDVIK and Gulliver. Changing table SUNDVIK It can be used for children under one year. It has plenty of space for storage of supplies by two additional tiers. The model is implemented in the white, gray and brown and black and brown. 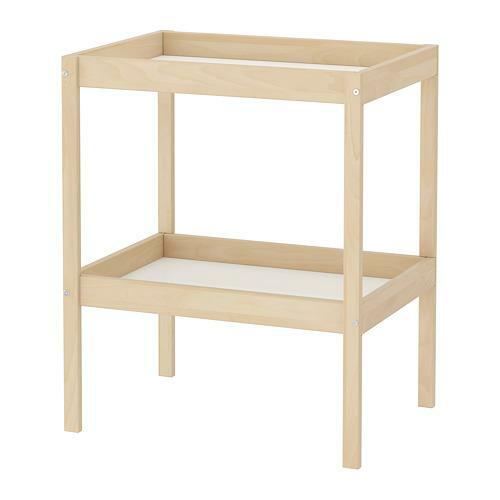 The length, width and height of the changing table SUNDVIK up 82 * 54 * 95 cm, respectively. In addition to the series SUNDVIK have the option of changing table, combined with a dresser. Its advantage is the presence of two drawers instead of shelves. This option is useful for those who keep baby equipment on open shelves for whatever reason do not like. 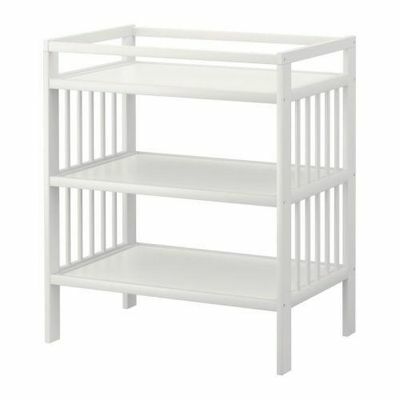 Another three-tiered model is changing tables from IKEA - GULLIVER. Due to its round details, it looks extremely gently and carefully. The upper tier is additionally equipped with a handrail for convenience and security. Details of solid birch worktop and MDF are very eco-friendly for children. This model changing table presented in white and the color of the tree. For small spaces, and the parents who love extra features specially devised such models changing tables as ANTILOP и SPOLING. ANTILOP convenient because it is attached to the wall if necessary. However, for different walls require different types of fasteners. This should take care in advance, as the fasteners are not supplied. ANTILOP consists of a sturdy steel frame covered with 100% polyester. 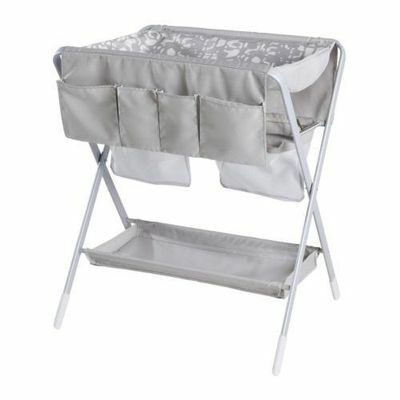 Changing table has a removable cover, which is recommended to be washed at a temperature of not more than 40 ° C.
Another model is a portable changing table - SPOLING. It is even possible to take long trips. It is convenient for storage. Another advantage is the presence SPOLINGA cover and pockets for storage of accessories (diapers, bottles, toys, etc. ), The storage grid, which can be used as a laundry bag. The remaining two models - HENSVIK и LEKSVIK - Perfect "fit" in any environment due to its design. Designer Carina Bengs made sure that these changing tables were not only suitable for children, but also pleasing to the parents. When your child gets older, HENSVIK simply transformed into an open section and LEKSVIK - in a chest of drawers with two drawers. The manufacturer recommends to fix the furniture to the wall with the supplied hardware. This will prevent it tipping over. Swaddle table-cabinet drawers LEKSVIK equipped with a stopper, that is, they are not fully put forward and do not fall. 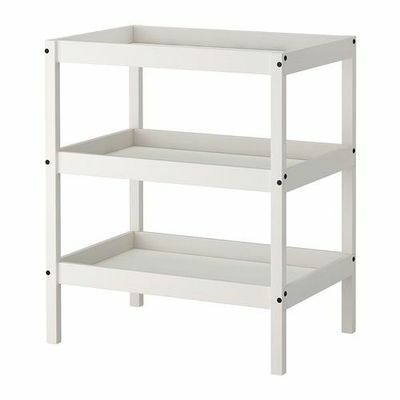 Caring for all the changing table from IKEA is very simple. You just need to wipe them with a damp cloth and wipe with a clean dry cloth. In the case of more serious contamination you should use the eraser, sandpaper or a mild soapy solution. It is also possible to apply means which are suitable for processing wood products. Almost all changing tables, if desired complemented by pieces of furniture and interior of the same name. 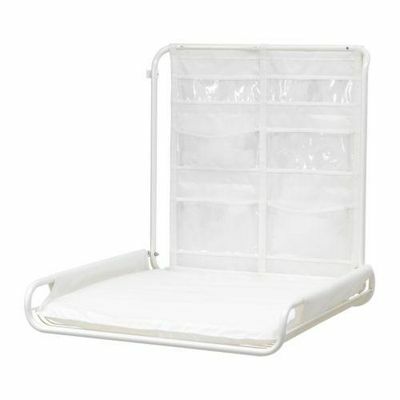 It can be cots for babies and cots, storage furniture, high chairsAnd accessories for more comfort and storage accessories.